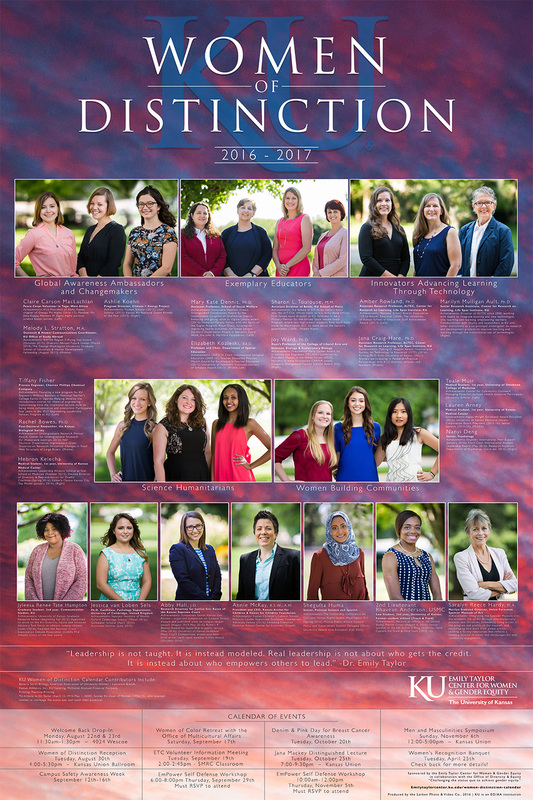 LAWRENCE — Twenty-three women with ties to the University of Kansas are featured in the 2016-2017 Women of Distinction calendar. The Emily Taylor Center for Women & Gender Equity, which produces the poster-sized calendar, will host a reception to honor the women and their achievements Aug. 30. The women represent KU students, faculty, staff, administrators and alumni who have distinguished achievements in their efforts at KU or in their community. Seven current students, six alumnae, and 10 faculty and staff are featured on the calendar. Five areas of service and distinction also receive special attention through the calendar: Innovators advancing learning through technology, exemplary educators, global awareness ambassadors and change-makers, science humanitarians and women building communities. First issued in 2004, the calendar was established to challenge the stereotyped representation of women in publications and the media and to provide an alternate view by instead honoring women for their accomplishments as leaders, entrepreneurs, role models and change-makers. A reception to acknowledge this year’s featured women and their contributions will be from 4 p.m. to 5:30 p.m. Tuesday, Aug. 30, in the Ballroom of the Kansas Union. The public is welcome to attend. Integrating the Spencer Museum into the academic life of KU through interdisciplinary projects and initiatives. Embedding living artists in the program and profile of the museum and encouraging new work from global artists. Leading a facility renovation that reflects a learning mission in action and encourages KU and community engagement. Second-year graduate student, communication studies, KU. Hampton’s hometown is Overland Park. She attended Shawnee Mission South High School; her parents are Reba and Matthew Tate. Research attorney for Justice Eric Rosen of the Kansas Supreme Court. Hall graduated in May 2016, and her hometown is Overland Park. She currently resides in Lawrence. She attended Shawnee Mission North High School. Her parents are Jackie Millin and Jeff Krieger. Senior, political science and Spanish, KU. Huma’s hometown is Wichita. She attended Wichita East High School. Her parents are Anjuman and Mohammad Anwar. Second-year law student, KU; former student athlete (Track & Field). Anderson’s hometown is Memphis. She attended Ridgeway High School, and her parents are Ray and Teresa King. Program director, Climate + Energy Project. Koehn’s hometown is Burns. She currently resides in Overland Park. She graduated from Fredrick Remington High School. Her parents are Rodney and Carolyn Koehn. Medical student, KU School of Medicine. Hebron graduated with her degree from KU in 2016. Her hometown is Gardner. She attended Gardner – Edgerton High School. Her parents are Habtamu Oda and Tewabech Korecho. Medical student, University of Oklahoma College of Medicine. Muir’s home town is Tulsa, Oklahoma, where she currently resides. She attended Jenks High School. Her parents are James and Mary Muir. Medical student, KU Medical School. Arney’s hometown is Stilwell. She attended Blue Valley Southwest High School. Her parents are Todd and Stacey Arney. KU Student Senate senior senator (2015-16).